Lipidro cream for optimal care of dry and sensitive skin. The high-quality ingredients compensate for a lack of lipids and moisture and naturally balance the protective properties of the skin. Urea absorbs water in deeper skin layers. Calluses are softened and excessive reformation is reduced. Sallow thorn oil and avocado oil with a high amount of unsaturated fatty acids supply dry skin with the lipids it lacks and thus prevent the loss of water through evaporation. this effect is supported by a special algae extract. Allantoin, an ingredient of the horse chestnut, promotes the regeneration of the skin. Farnesol has an antibacterial and deodorising effect. 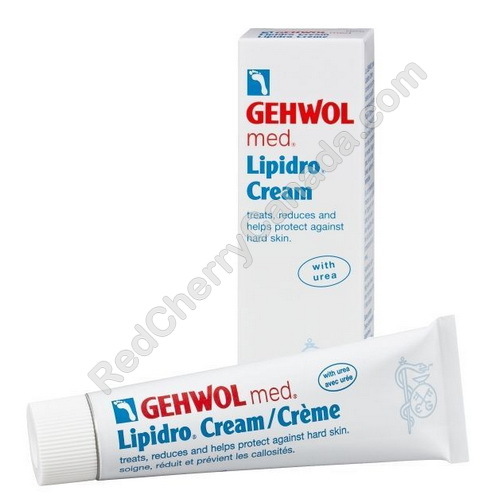 Daily usage of Gehwol med Lipidro Cream gives you protection against foot odour and infections and has an anti-inflammatory effect.